The avant-garde of neoliberal horrors has finally done away with the 8-hour working day. On June 13, the Polish government eliminated the 8-hour working day, a right which was won in 1919. The government supposedly is trying to make Poland even more “competitive” for capitalists who want to earn more through exploiting the poor worker protection in the country and the scandalously low wages. This is a major attack to the working class, smuggled by with little notice of the world press and little protest of the collaborationist unions. Poland is the laboratory for the introduction of the worst neoliberal dismantling of workers rights and the working class lived up to their masters’ expectations by keeping at work, begging for crumbs from their masters’ hands. If it went so smoothly here, one wonders where they will strike next. 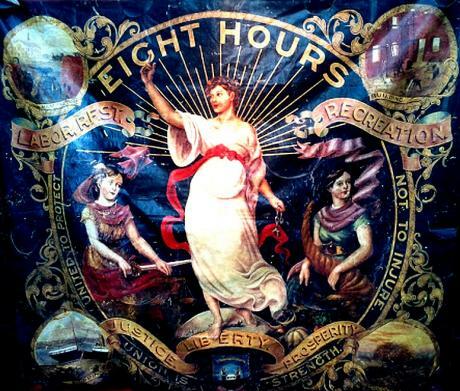 The elimination of the 8 hour day is accomplished by increasing accounting periods for calculating the average amount of hours worked for the whole year and by also introducing flexible working hours. In the past, you had to have a certain resting time between your shifts and if your shifts were moved from day to day, it could be considered outside your normal working time. You would then be entitled to overtime pay. The new rules allow bosses to impose much longer working days, so long as if some other time of the year they cut the hours. For workers in some industries and areas, this could mean long days for all their working time, and a few months of idleness, instead of stable working hours. It is also not clear what rights workers who are hired temporarily (for example for 6 months) would have under this scheme. What is clear is that already for many years, Polish employers openly defy whatever rights workers still have and nobody wants to crack down on them. In the meanwhile, workers are facing a myriad of unprecented attacks against their well-being. However most are disorganized, controlled by concessionist unions or uncertain about their ability to act, being afraid of widespread repression. Yet others have been successfully brainwashed by years of neoliberal propaganda from every corner. The ammendments to the Labor Code were drafted by a young and eager neoliberal careerist, trying to win the favour of the state puppetmasters. Władysław Kosiniak-Kamysz is a 32-year old doctor who first ran for the City Council of Krakow in 2010. He was not elected, but took the place on the list of another. With all of this “experience”, about one year later, he was made Minister of Labor (!!!) and the next day became vice-chair of the PSL party. He introduced the ammendments to the Labor Code which effectively abolish the guaranteed 8-hour working day. Not that Kosiniak-Kamysz is the only villian. He is clearly in his job to do the dirty work of the employers’ lobby, business and political interests. They apparently see no limits to what they can force on the people, since they have been given a green light and an open road by all those who have swallowed their neoliberal medicine for far too long. Posted on June 24, 2013, in Europe and tagged Poland, Worker's Movement. Bookmark the permalink. Leave a comment.